Want to earn a college degree, but not sure which school to choose? Check out this list of colleges with the highest alumni salaries. Choosing a college isn’t a simple task – you want to pick a school that will challenge you intellectually and provide you with life experiences that help you grow as a person. But unless you want to live in your parents’ basement for the rest of your life, you also want to pick a school that prepares you for a successful career, both in terms of getting hired and equipping you with the skills to properly do your job. 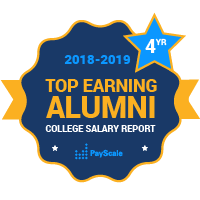 PayScale’s College Salary Report has ranked colleges and universities by the median salaries of their alumni. By knowing how much you can expect to earn after getting your bachelor’s degree, you can choose a school wisely and set yourself up for future financial security, especially when evaluating how much to borrow to help pay for your education. You might assume that the highest earners in the country come from well-known Ivy League Schools like Harvard or Princeton, but the truth is, the highest median alumni salaries often come from students who attended small colleges with strong engineering programs. If we focus on early career earnings, elite military schools reign supreme. For bachelor’s-only graduates, the United States Military Academy at West Point and the Naval Academy at Annapolis are often home to high earners. The fact that West Point and Naval Academy alumni graduate with military experience probably increases their worth to employers. But don’t count liberal arts schools out just yet. Harvey Mudd and the USNA are both technically liberal arts schools as well because of the curriculums they require of graduates before receiving their degrees. However, even more classically styled liberal arts schools, like Washington and Lee University, Colgate University, Carleton College and Williams College produce high-earning graduates. Prospective students should just be aware that a liberal arts degree may mean it takes them a longer time to get settled in the career of their dreams, but their well-rounded, analytical skillsets and ability to clearly communicate can set them up for successful careers.